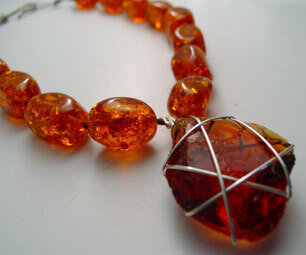 Amber Resin and Glass Necklace, $55. Peel’s pieces are all one-of-a-kind, handcrafted works of art using some of the earth’s most gorgeous gemstones. Artist Krista Peel is a self-proclaimed “rock fanatic.” Peel grew up surrounded by the picturesque plains of Cheyenne, Wyoming where her childhood days were spent appreciating the undisturbed elements of nature. “It was very serene, and as a child in a rural area I was surrounded by these intricate rocks and stones. There were not the distractions children have today, so I developed a very keen sense of the land around me and nature,” explained Peel. 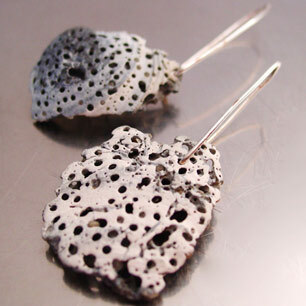 Peel discovered these beautiful shell fragments recently at the Jersey shore and converted them into one-of-a-kind wonderfully dimensional earrings, a perfect complement (and conversation piece) to any summer outfit, $25. Gem lovers will be salivating as they peruse Peel’s collection (kristapeel.etsy.com) and her crisp cornucopia of semi precious gemstones and vintage materials. Among the dizzying-and delightful-choices of materials that are mounted on silver and gold wires: amber, blue chalcedony, moonstones, opalite, green quartz, dark brown freshwater pearls, pale green jade, smokey quartz, lava rocks, rainbow flash labradorite, apricot moonstone, lapis lazuli, vintage salmon acrylic, Botswanan agate, milky white sea glass…and more. “It’s always evolving what I design with, what I gravitate towards and how I find my materials. I started out in bead shops looking around at the endless possibilities-after a course of time some stones appeal to me more than others. I just found micah and a slew of quartz rocks on my mother’s property in Delaware. 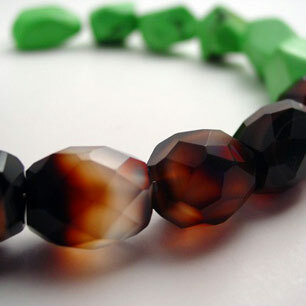 So, this morning I already researched how to take raw materials and translate them into beads,” explained Peel. 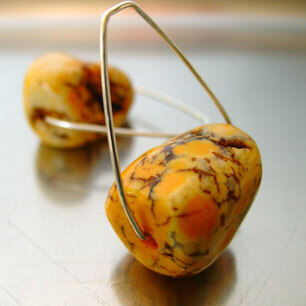 Howlite dyed large yellow turquoise nuggets on silver hand formed earwires, $27. Huge nuggets of green gaspeite turquoise and multi-toned botswana agate faceted beads hang on silver wire, 17" long, with a handmade silver clasp, $85. Hitting the Books: Peel has a voracious appetite for literature that explores the history of rock formations. Backyard Find: The collection of quartz materials recently discovered in her mother’s Delaware backyard will someday be transformed into beautiful and unique pieces for Peel’s ever-evolving line. Pet Project: Peel and her husband Zak Starer, a video tech at Moore College of Art, started a groundbreaking program for visiting artists called PhiladelphiaArtHotel.org. In the beginning of July, the art hotel (currently their home in West Philly) welcomed its first artist to its residency program for about a week’s stay. Having a designated period of time where artists can focus on their work can be crucial for their creative process. By the end of ’09, there will be a new building and locale for the visiting artists. “If, through the hotel program, Zak and I can enrich the art community each and every day, that will be one of the most rewarding personal ventures and a dream come true,” enthused Peel. i love Krista’s designs too. the sense of color is a prevalent in all her works, so i celebrate her starting career as interior designer!